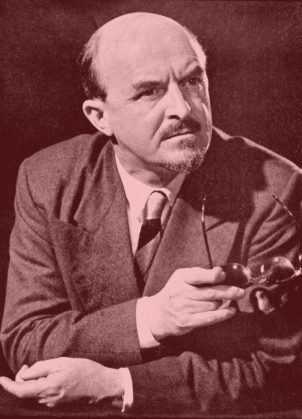 Mansel Thomas was a distinguished Welsh musician – composer, pianist, conductor, adjudicator, examiner, Festival Director and BBC Wales Head of Music. His was a very busy and wide-ranging life in music, but his great love was composing, and his enormous corpus of compositions is testimony to this – over 400 titles now in print. A native of the Rhondda Fach in South Wales, he won the Rhondda Scholarship and at the age of 16 went to the Royal Academy of Music, London to study composition and piano. There he enjoyed a brilliant studentship, winning prestigious awards and graduating in 1930 with an external Durham B.Mus degree. He then spent five more years in London as a composer, conductor and repetiteur, and in 1936 joined the BBC in Cardiff as music assistant and deputy conductor of the newly-formed BBC Welsh Orchestra. Following war service, he returned to the BBC and became Principal Conductor of the orchestra, and in 1950 was appointed Head of Music, BBC Wales. These were formative years and broadcasts of Welsh music and Welsh artists increased in frequency and quality under his professional scrutiny. However, in 1965 he retired from the BBC in order to devote himself to composition, and thereafter produced what is probably his most important corpus of compositions, especially in vocal and choral spheres, including works for the Royal Investiture of 1969. There are over 150 original solo songs and arrangements – such as Y Bardd, A Hymn to God the Father, and the sets of twelve songs including Caneuon Grace a Siân. The choral music involves various groups – male, female, mixed and children’s choirs – and includes motets, anthems, partsongs, arrangements, and larger choral works, such as Psalm 135, the cantata In Praise of Wisdom, and the Three Songs of Enchantment. His many instrumental works explore varied ensembles and are crowned by his Piano Quintet, Mini Variations (Brass Band), and Theme and Variations (orchestra). The Mansel Thomas Trust, set up in his memory, ensures that his vast compositional legacy is published and promoted. For performers there is much to discover in the high craftsmanship and attractive style of this composer’s music. With thanks to Terence Gilmore-James of the Mansel Thomas Trust. / Gyda ddiolch i Terence Gilmore-James o'r Ymddiriedolaeth Mansel Thomas. Mansel Thomas's manuscripts are held at the National Library of Wales. Please visit the database of their collection here. Mae llawysgrifau Mansel Thomas o fewn casgliad Llyfrgell Genedlaethol Cymru. Ewch i chwilio'u bas data yma. 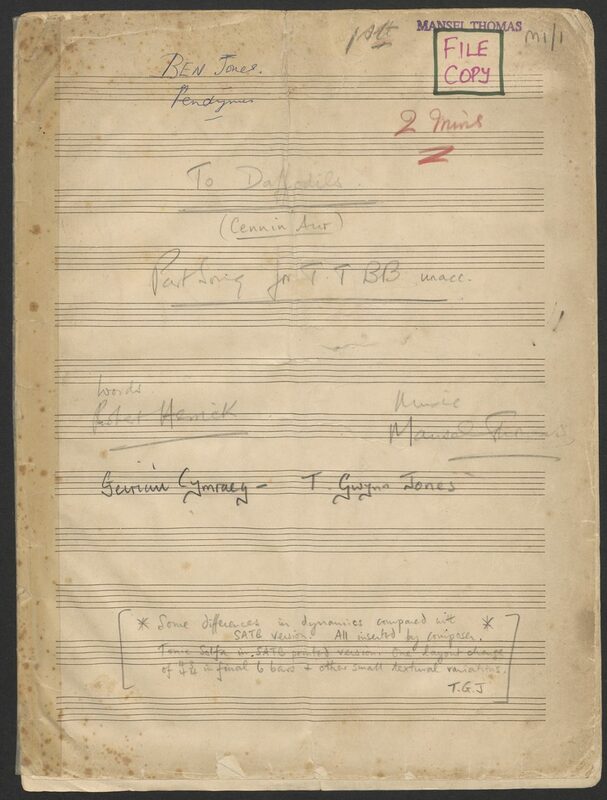 This partsong was composed during Mansel Thomas’s early student years at the Royal Academy of Music, London where he studied composition and piano from 1925. He was inspired to set for male choir the poem To Daffodils by the English lyric poet and cleric Robert Herrick (1591-1674), and this he sent to the Pendyrus Male Choir which was formed in 1924 and which he heard rehearsing in a junior school next to his home in Tylorstown in the Rhondda Fach. 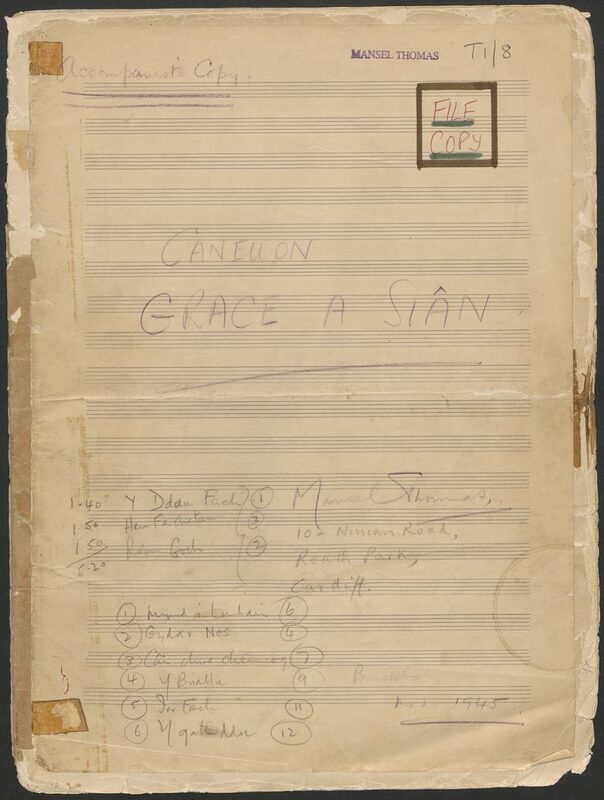 The manuscript of the partsong was received in 1927, and there is evidence of a performance in English by a male choir (Glee Society) that same year and also of frequent radio broadcasts in Wales thereafter. It retained such a firm place in the choir’s repertoire and was so popular that W.S. 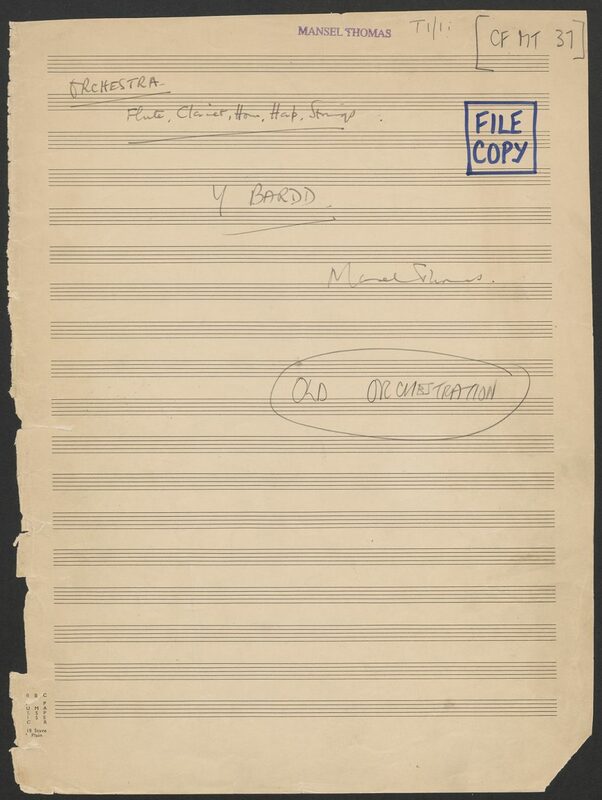 Gwynn Williams (Gwynn Publishing) requested of the composer an adaptation for mixed voices (SATB) which was published (entitled Daffodils) in 1939. At that stage a version of the poem in Welsh by T. Gwynn Jones and entitled Cennin Aur was added. The music tenderly reflects the poem’s regret that spring daffodils ‘…haste away so soon’, a life-span, as for mortals, which is but short. The musical setting by the teenage composer is remarkable for the maturity of its melodic, textural and harmonic framework, and especially also for his sensitivity to the poem’s varied rhythms, which he interprets with brilliant metrical assurance. There was great excitement from both Grace and Siân when the envelope of manuscripts (dated “Medi/September 1945”) arrived from Brussels! They soon sensed that the songs have immensely attractive and memorable melodies, whether bright or reflective, and the piano part adds greatly to the character and mood of each. The majority of the songs are under a minute each in duration, and in the Qualiton LP recording (QMP 2000) by Esme Lewis (Soprano) with the composer accompanying the total duration for all twelve songs is less than twelve minutes. There are two other commercial recordings of the songs which also deserve reissue on CD. These songs commend themselves very much for performance by young and very young singers, whether individual or in unison groups. The music for this song was composed in the early years of World War Two, and it was published in 1945 as a song for all vocal registers except bass. After returning in 1946 from war service (largely abroad), Mansel Thomas took up a more senior BBC position as Principal Conductor of the re-constituted BBC Welsh Orchestra, and the opportunity then presented itself for performance of this song with orchestra. His orchestration took account of both the modest resources available and the restrained character within his setting of the words – strings with flute, clarinet, horn and harp. The strings kept well within the scope of the piano part, and features given to the wind instruments tended towards solo material and melodic enhancement. However, as the orchestra’s resources increased in the early 1950s, Mansel Thomas was enabled to realize richer orchestral textures by doubling the wind section, and introducing frequent ‘divisi’ scorings for the strings – a heightening and expanding of the string registers not only at the start, but also in the more impassioned central section and for the final chordal codetta. This “New Orchestration” (as it was termed by him) was therefore ready also for the 1957 Qualiton LP recording of the song by soloist Helen Watts (contralto) with the London Symphony Orchestra conducted by Mansel Thomas – a recording of great merit and long overdue for reissue on CD!